In revisiting the small coastal towns along this route, I keep asking myself, “What exactly did I find to do in this town for a whole week last time?” I have to continually remind myself “You were working 8 hours a day, five days of that week.” Although I may have spent a week in that town, by the time I accounted for the work week plus drive time on the weekends, I really only had a day to explore. Since I have more time for exploring on this trip, I looked forward to prodding and probing deeper in each stop along the way while revisiting some of my favorite destinations. Only I am finding I may have allotted more time than I need. 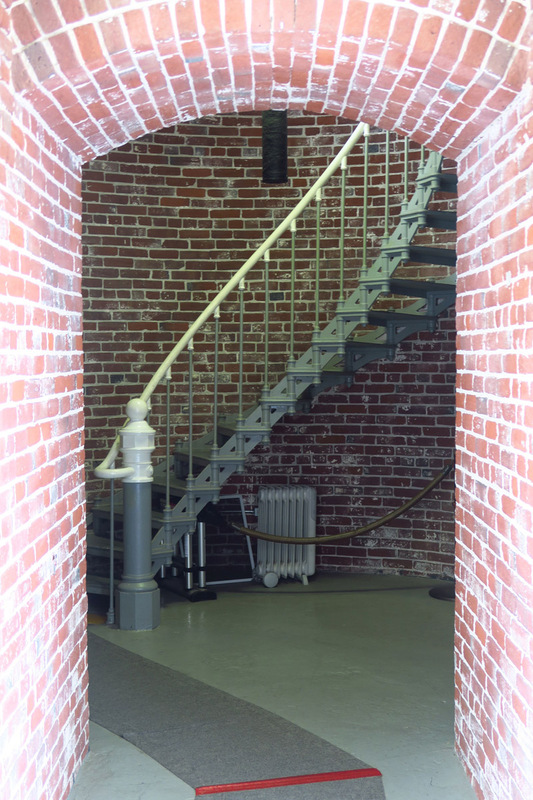 One of my top three reasons for returning to the Oregon Coast….the Umpqua Lighthouse. Dare I exaggerate, its lens is one of the most beautiful man made works of art I have seen. 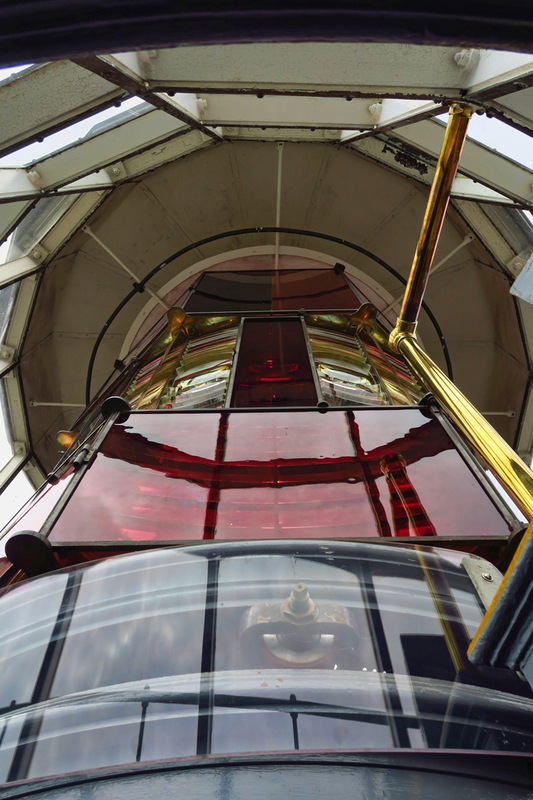 I compare going up into the lens room and sticking my upper body into the rotating, candy-striped Fresnel Lens (as far as allowed) to be akin to being inside a life-size kaleidoscope. It’s a good thing I have a few waypoints planned along the way to slow me down. Without the structure of the job to hold me down, I might otherwise be in Alaska by now without a map. I scheduled some meet-ups with friends, and I need to have some minor repairs done to the Winnie. After my major hitch overhaul, my tow lights still don’t work properly. And the Tracker has a chronic short in the battery terminal wiring that needs to be addressed. 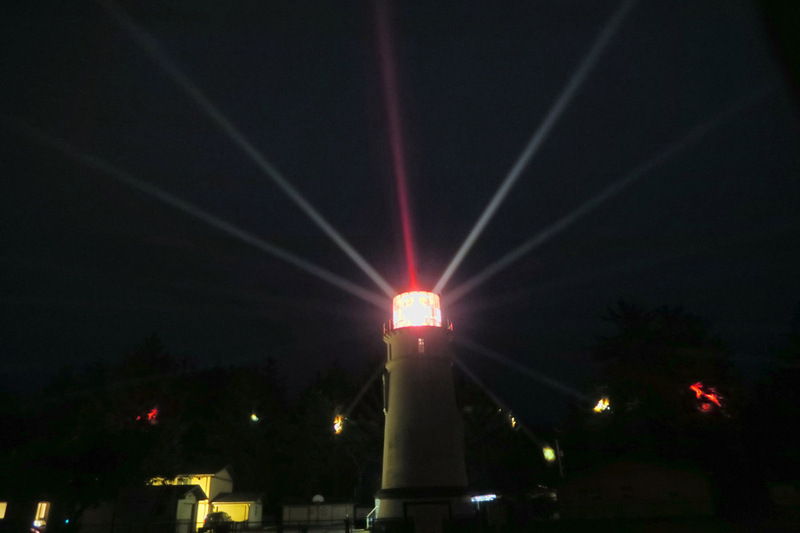 The First Order Fresnel Lens has 24 bulls eye panels which dictate the characteristic, or “signature,” 2 white flashes and 1 red flash every 15 seconds as the lens completes rotation every two minutes. You can see the red and white “spotlights” reflecting in the trees in the background as the light beams revolve. I didn’t get to see the lens at night last time, so I wanted to come back and see it after dark. Even more spectacular! 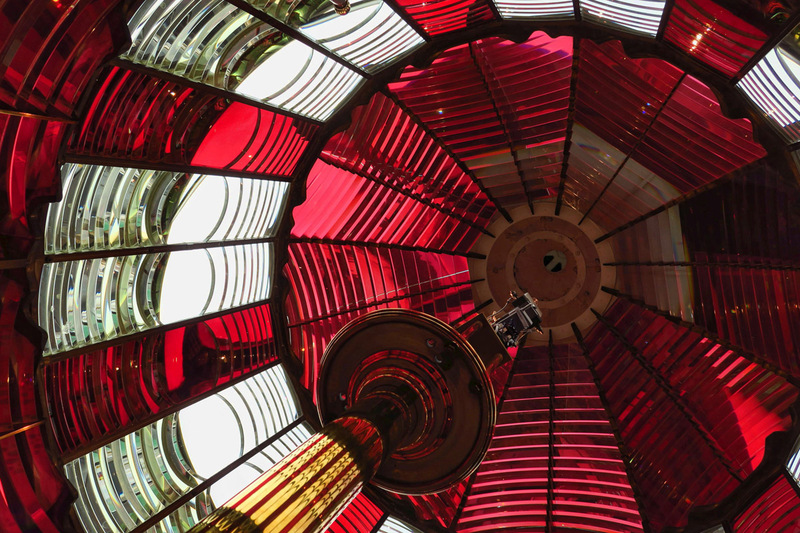 Do you know which state has the most lighthouses? Michigan! The little coastal towns are dripping with charm for the tourist-minded. Lots of curio shops. 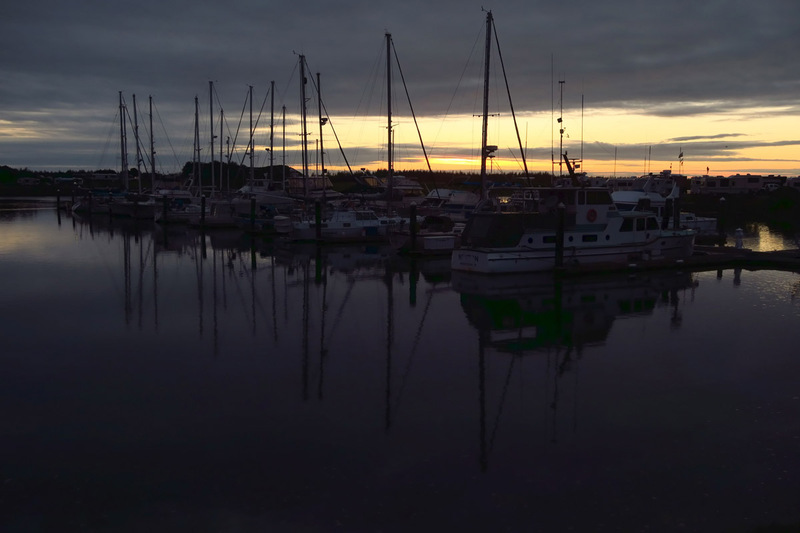 Picturesque marinas with charters for hire. And an abundance of local restaurants advertising “Readers Choice Winner! Best Fish & Chips on the Oregon Coast!” But I wasn’t much of a shopper even back in my “metropolitan-ite” days. Even less so now. And one can only stroll so many docks dreaming of a life at sea before they all start to look alike and the catchy boat names become redundant. That only leaves one thing….all the charming restaurants, which I can’t afford…physically even more than financially. 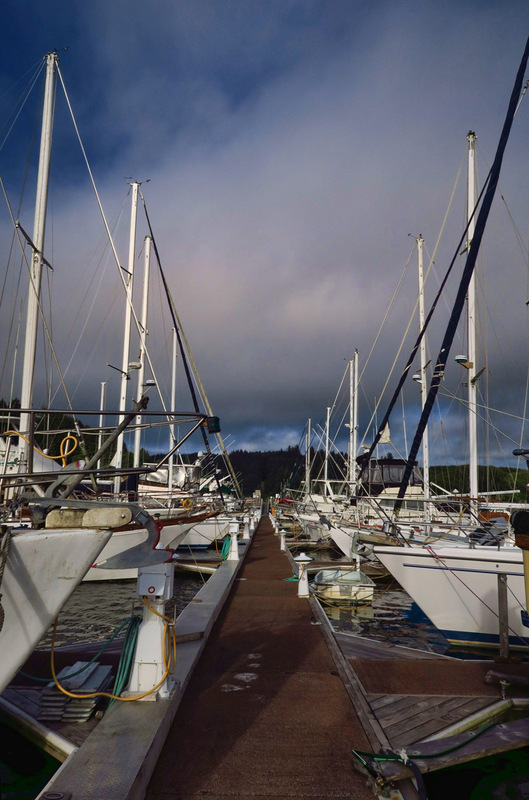 Salmon Harbor Marina and RV Park makes a great place to stay long the coast if you want to see the lighthouse and sample the “aquaculture” of the oyster beds. Only $15/nt. The lovely ambiance held me captive for four nights. Kite-flying, an art along the Oregon Coast. 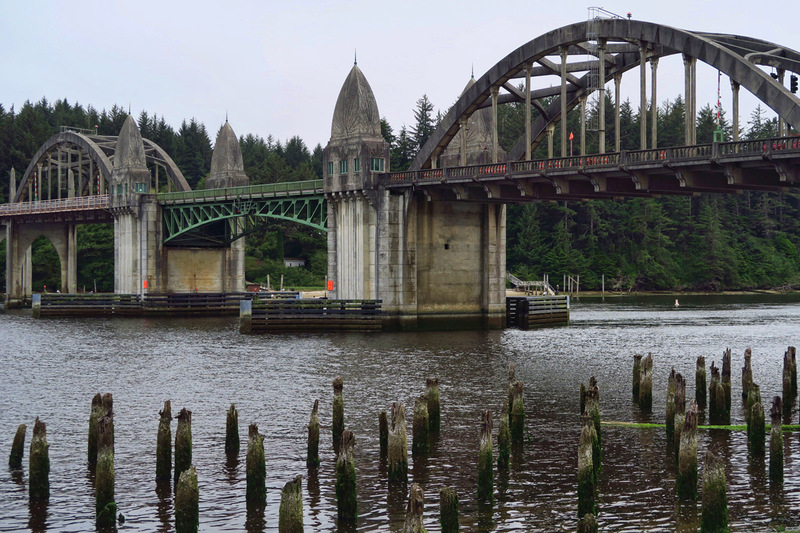 Beautiful Siuslaw River Bridge as seen from historic downtown Florence, OR. 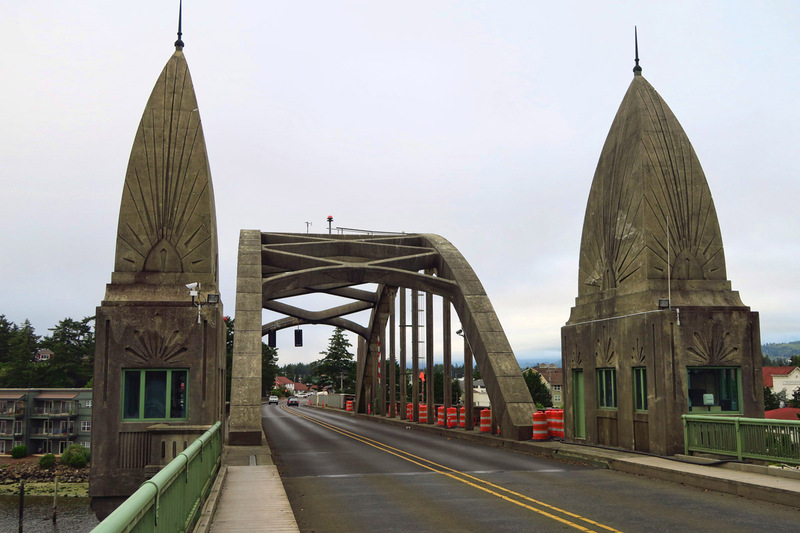 One of five Oregon Bridges designed by Conde B McCullough as part of the Coastal Bridges Project built during the Great Depression as a part of Roosevelt’s New Deal. A “double bascule” drawbridge, it still functions today to allow fishing boats and sailboats with tall rigging to travel upriver. Even the moody, broody fog is starting to get to me. I’m cold, and I’m tired of wearing long pants and a jacket in the summertime. And I am in serious hiking withdrawal. If I continue on at this pace, I fear I won’t enjoy the second half of the summer, for which I have planned more of the same. I need a temporary break from the coast. Time for me to retreat into the woods…before the coast is clear. 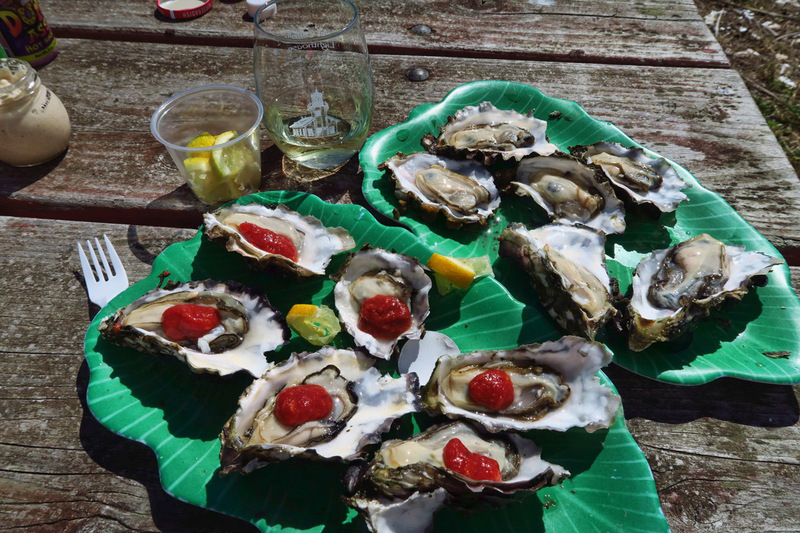 This entry was posted in State Parks and tagged Salmon Harbor RV Park, Triangle Oysters, Umpqua River Lighthouse, Winchester Bay by Suzanne. Bookmark the permalink. You got the night shot at Umqua!!!! Oh droooooool! I missed that shot when I was there so seeing your pic just makes me all warm and fuzzy inside. 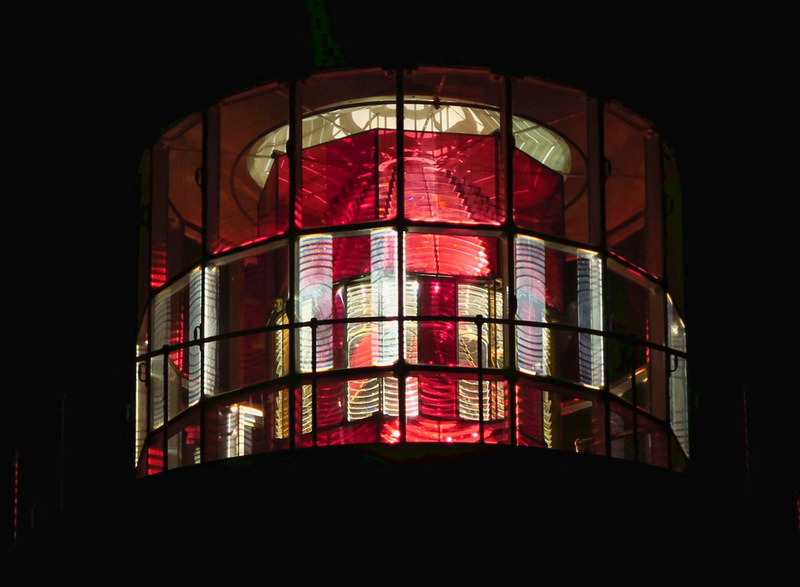 Nice shot of the lighthouse at night. That bridge is very good and the architect has made a big feature of it. That summer fogs gets to me as well! But I love walking the beaches. Flat hiking and on the Oregon Coast you often are thwarted by impassable cliffs . No you do not exaggerate about the lens. 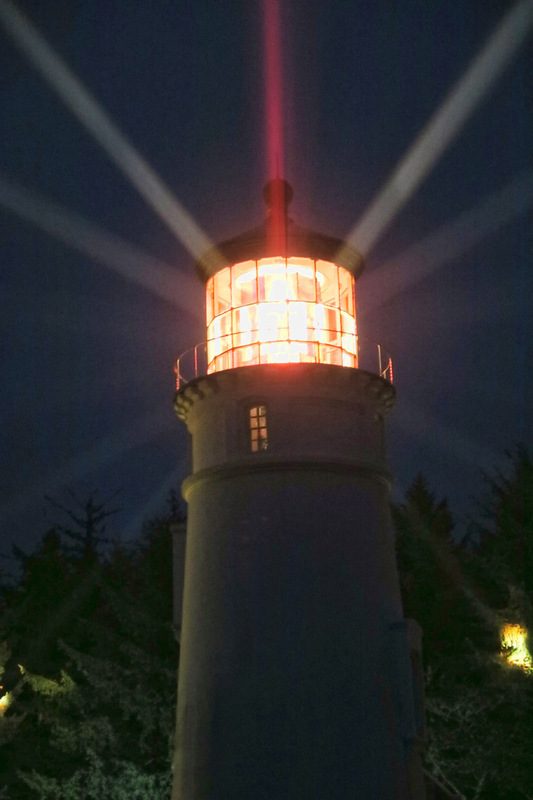 It is one of the most beautiful things and your pictures of the lighthouse and its lens are terrific. I know the feeling of needing a break from a particular landscape and from a too cool summer. But just now in the Finger Lakes where it is supposed to be in the mid to upper 70’s but is in the upper 80’s to low 90’s, I think I could take a spell of long sleeves and pants. I’m glad you aren’t trapped by reservations and can take the break you recognize you need. 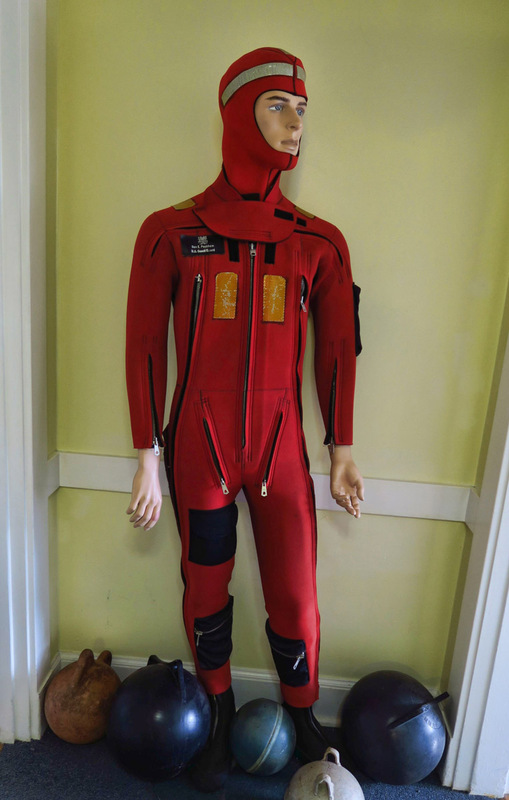 That diver’s suit made me laugh out loud at your right & left handed comment! Nostalgic for me to see the Florence pix. Thanks! Used to get a cappucino at the coffee house near where you took the pic – perhaps exactly your vantage point? Happy hiking! My husband and I so enjoy your blog journal. We are recently retired and inspired to get on the road. Many thanks for sharing your journey. Hi, Sharon. Thanks for the nice comment. Yes, I was standing facing the bridge just to the left of the coffee house you mentioned. I started to go in for a latte, but there was a “Pokemon scuffle” taking place outside the front door, so I moved on. Lovely area! Thanks for following along. Hope you enjoy your retirement as much as I have enjoyed mine! If you can, spend a weekend day on the beach at Pacific City watching the Dory Boats slide up on the sand and others going out to see. There’s the Pelican Brewery right there. I used to get lunch to go and Jack and I would sit on the beach and love it. ( https://travelswithmrnimble.blogspot.com/2010/08/where-is-jack-day-112.html ) We’re different because I loved having to wear long pants and a sweatshirt the whole summer in 2010. I hate the heat. There’s also a great gal who has reasonable prices for whale watching out of Depoe Bay which was not only educational, but a blast. Jack and I had a great time on the small zodiac boat. When I’m on the coast next summer, I want to do the Rogue River Mail Boats. I love the Columbia River and if I could choose a place to live it would be Astoria. I spent a lot of time in the Tillamook area, taking day trips. Loved the light house pictures, especially those of the lenses. We went up the coast at this time of year in 2012 and missed many coastal views because of the morning fog. It would be nice to repeat it, but going the other way so that you are on the coastal side, but maybe not in Summer. Your post triggered a question that I’ve had for awhile that perhaps you could provide an answer to. 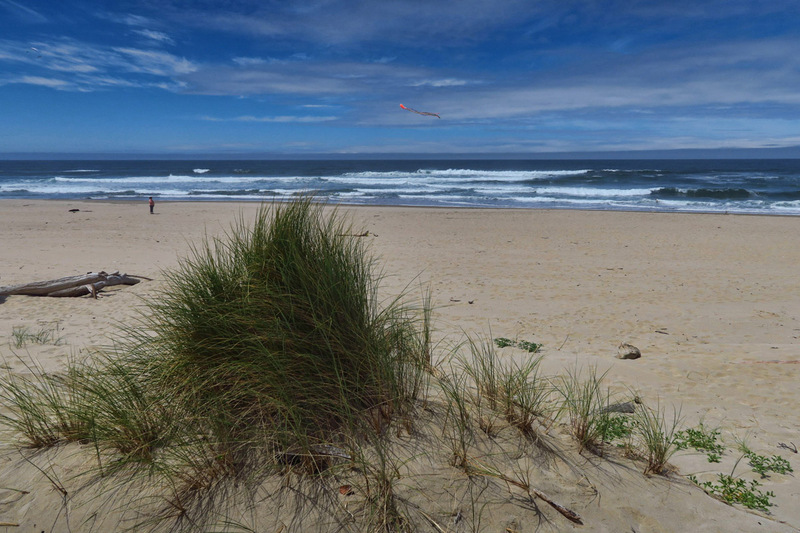 Lots of RV folks list the Oregon coast as a popular RV roadtrip trip. I’ve contemplated going out there, but I grew up on the coast of Maine and saw craggy ocean views, beaches, lighthouses, and coast line on most of the days of my teen years. Do you feel that if someone saw 100 miles of the Oregon coast then they’ve seen it all? Is it repetitive or are each town and area unique? Just looking for an opinion. I read your recent post on going up to the McKenzie River and that area seems much more appealing. Hi, J. Dawg– Thanks for the great question. The first time I came up the Oregon Coast in 2014, I was awe-struck. Completely enamored. But the second time around, it’s more like “been there, done that, and wish I’d bought that tee shirt.” haha!! Yes, it’s beautiful, but no more so than the “downeast” sections of Maine that I’ve seen. For someone who grew up in Texas, it’s the Emerald City. But for someone who grew up in Maine, well, I am not sure you would feel the same awe. I do love the Oregon coast so much but the mountains seem to call to me after a time. I think this winter I am going to have to escape to get some serious hiking in. I am loving your photos, even more than I have in the past. How are you doing with your new camera? You are getting some incredible shots. Continuing to thoroughly enjoy your writing and your photos. These last few posts are from very familiar territory. Pete grew up in Lincoln City (before 5 or 6 villages combined to become Lincoln City) and my wonderful aunt lives in Newport, having moved there with my uncle from San Luise Obispo where I spent a week or two every summer of my adolescence. 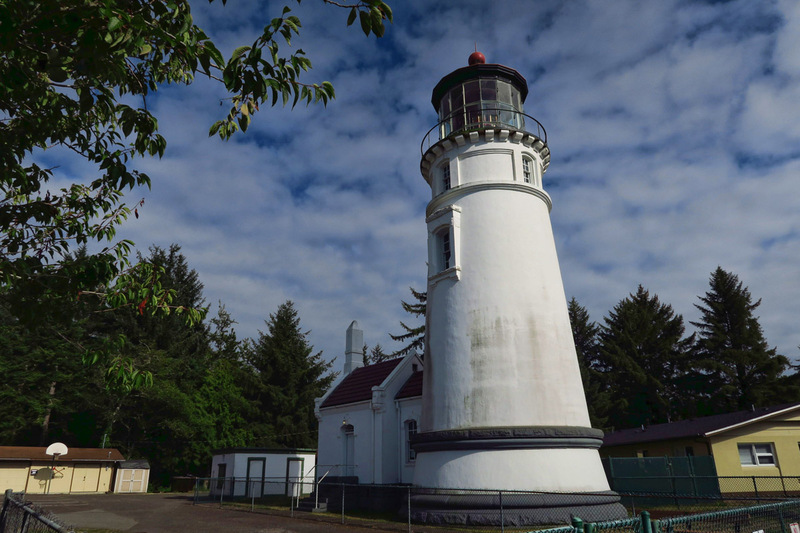 Pete and I have driven the route to (and beyond) Lincoln City countless times, but never entirely at the leisurely pace you describe in our rig…Looking forward to trying some of the places you’ve described for eating, walking/hiking, and staying, someday. 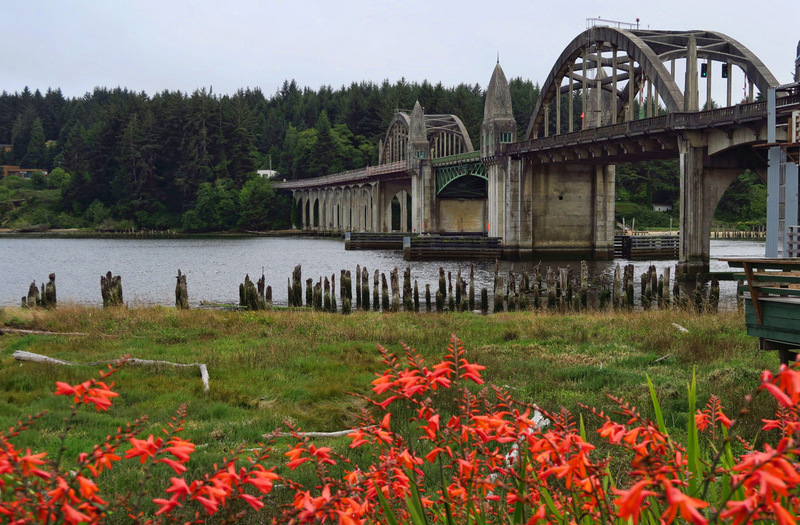 A note about western Washington and western Oregon: those coastal villages had to turn to tourism to survive when the logging industry basically shut down in the 1980s. Those towns were so hard hit, it’s difficult to imagine. In the eastern parts of those states, agriculture and ranching has traditionally been the primary economy (apples, wheat, and around Yakima a wide variety of fruits and veggies, and grains; now vineyards and hops dominate much of the region), so the culture in those areas is vastly different than on the west side of the Cascades – many escape the dry relentless heat east of the mountains to the coast for the weekends and short, affordable vacations. I used to detest the culture I grew up in (eastern WA) but have grown to appreciate it, and like to think that I aspire to take the best of both worlds. Now to get current with your blog. Looking forward to your next entries!